The Hollywood film industry relies heavily on recycled ideas. In 2014, for example, only one of the ten top-grossing movies—Interstellar—was not a sequel, remake, reboot or episode in a franchise. In the coming weeks and months, Cancerian, you'll generate maximum health and wisdom for yourself by being more like Interstellar than like The Amazing Spider-Man 2, Transformers: Age of Extinction, X-Men: Days of Future Past and the six other top-ten rehashes of 2014. Be original! You sometimes get superstitious when life is going well. You worry about growing overconfident. You're afraid that if you enjoy yourself too much, you will anger the gods and jinx your good fortune. Is any of that noise clouding your mood these days? I hope not; it shouldn't be. The truth, as I see it, is that your intuition is extra-strong and your decision-making is especially adroit. More luck than usual is flowing in your vicinity, and you have an enhanced knack for capitalizing on it. In my estimation, therefore, the coming weeks will be a favourable time to build up your hunger for vivid adventures and bring your fantasies at least one step closer to becoming concrete realities. Whisper the following to yourself as you drop off to sleep each night: "I will allow myself to think bigger and bolder than usual." The bad news is that 60 percent of Nevada's Lake Mead has dried up. The good news—at least for historians, tourists and hikers—is that the Old West town of St. Thomas has re-emerged. It had sunk beneath the water in 1936, when the government built the dam that created the lake. But as the lake has shrunk in recent years, old buildings and roads have reappeared. I foresee a comparable resurfacing in your life, Libra: the return of a lost resource or vanished possibility or departed influence. Can you afford to hire someone to do your busy work for a while? If so, do it. If not, see if you can avoid the busy work for a while. In my astrological opinion, you need to deepen and refine your skills at lounging around and doing nothing. The cosmic omens strongly and loudly and energetically suggest that you should be soft and quiet and placid. It's time for you to recharge your psychospiritual batteries as you dream up new approaches to making love, making money and making sweet nonsense. Please say a demure "no, thanks" to the strident demands of the status quo, my dear. Trust the stars in your own eyes. I believe it's a favourable time for you to add a new mentor to your entourage. If you don't have a mentor, go exploring until you find one. In the next five weeks, you might even consider mustering a host of fresh teachers, guides, trainers, coaches and initiators. 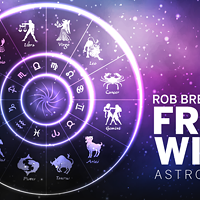 My reading of the astrological omens suggests that you're primed to learn twice as much and twice as fast about every subject that will be important for you during the next two years. Your future educational needs require your full attention.